Oh no! You are using a really old version of Internet Explorer. Some features won't work correctly! We started creating websites in 2003 and haven't looked back. We currently have over 150 sites under our belt and are growing year on year. We don't employ sales people, most of our work comes from word of mouth - we simply create sites that maximise your company's potential. Our team are all experts in their field - we employ only the best developers and designers. If you would like to discuss your project, then please get in touch. Website Development Ltd supply custom-built web applications and sites to small and medium sized businesses. We are specialists in the delivery of secure e-Commerce and database driven projects. Our approach is goal - rather than features - based. 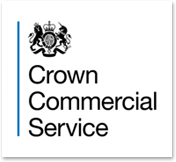 We are also proud to be a Crown Commercial Service (CCS) supplier. The CCS acts on behalf of the Crown to drive savings for the taxpayer and improve the quality of commercial and procurement activity. If you work for the public sector and are buying goods and services for your organisation, you can use the CCS to buy a variety of goods and services. Peter is the Director of Website Development Ltd. and founded the company in 2003. Peter's amiable, hands-on approach benefits our many new and loyal clients. Bio Facts: Peter loves cricket, riding to work and placing items out of sight on high shelves - although this might just be a side effect of his prodigious height? Andrew has been working at Website Development Ltd since 2006. He specialises in Coldfusion and PHP development, his framework of choice being Drupal. When he's not coding Drupal websites, he's dreaming about coding Drupal websites. Andrew's role also includes managing multiple projects and clients, as well as taking care of our Drupal web and backup servers. Bio Fact: Manages to hold down a job as a web developer without drinking coffee. Dee is our resident Designer and ensures that our client's websites deliver oodles of aesthetic goodness and a seamless UI experience. If you need help or advice to turn your ideas into reality, Dee would be delighted to speak to you and get the ball rolling. Born in Harrow, Dee spent over 10 years in the computer games industry in London, working for clients such as LEGO, Hasbro and Westwood Studios, before transfering his artistic, UI and UX talents to the field of website design. Bev keeps a watchful eye on all things financial. Luckily for us, Bev also ensures that our company headquarters remain bright and sparkly and that our developers all wash behind their ears. Bio Facts: Bev is a tenacious netball player. We can supply all of your online goodness in one place, makes sense really. By being your one-stop-web-shop we can seamlessly orchestrate your business in an online world. Every project is bespoke, we aim for goals not features - these are the fruits of our labour, if you like what you see please get in touch. We are always happy to chat about a potential new project, often we come up with solutions that go far beyond the initial idea.